Are you smarter than an Australian Shepherd? If you are, then please keep READING! I’m Jake and I am looking for a very special person and/or family to call my own. They say I am an Australian Shepherd/Blue Heeler mix. All I know is that I need to use my brain every day or I simply don’t know what to do with myself. If you take the time to teach me things, I will try to amaze you with what I can learn. I’m 6 years old but that has not slowed me down one single second. I love playing with other dogs. I REALLY love to be on the go and doing things with my people. My foster mom and I are working with a trainer right now. If you have always wanted to “teach a dog new tricks’ (which is COMPLETELY possible in my case), please click here to read more about me. I'm Jake and I know it is hard not to fall in love with my big smile and my cute face, but to be able to keep me really happy, I need daily training too. I need a home where I can keep my mind AND my body busy every day! I get along with other dogs and I like to be around my family when I am at home – even if I’m just sitting nearby chewing on my favorite bone. I always like to know where my family members are (perhaps it’s the herding breed in me). And I love it when people pet me and talk to me (I’m secretly trying to learn as many human words as possible!). 1. I am learning that it is not acceptable to pull on a leash and try to be the leader when I am walking. I need a person/family who will not allow me to be bossy like this. I am learning the command “let go” so that I know how to listen to my person and be polite. 2. I am learning that I must not allow moving cars to get me overly excited and that when I hear the word “stay”, I need to do just that and let my person be in control. I am learning to manage my excitement on car rides. I just get so excited that I can’t help myself and keep yelling during the car ride. I am working on keeping my cool. I am getting used to wearing my doggy seat belt and that has really helped a lot! I am learning to understand that I cannot bark and run and jump every time I hear the doorbell or the door opens. I love people so I get SO excited – but I need someone who will make me stay on my spot and be a good boy. I can forget how big I am and that it is rude in the human world to be so rowdy! For this reason, the best home for me would not have young children as I might accidentally bump into them. I am also learning how to be alone. It has been hard for me. I think I still worry that my person will never come back and I just get very anxious. But I am working really hard with my foster mom and my trainer to be calm and know that I will never be abandoned again. I think my 7-week behavior class is gonna be awesome. I’ve also started using a treadmill and taking lots of walks. The best home for me would be with an active family (with middle school children or older) who is willing to continue to work with me on my training and taking me for daily walks, hikes and other adventures. I need to be “working” every day (walks, visits etc...). My foster mom and trainer take me to places like Pet Valu to work on all these things. They are also teaching me “pushups” to work out my extra energy (sitting with my 2 front legs up – then going into a ‘down’ position – then sitting back up). 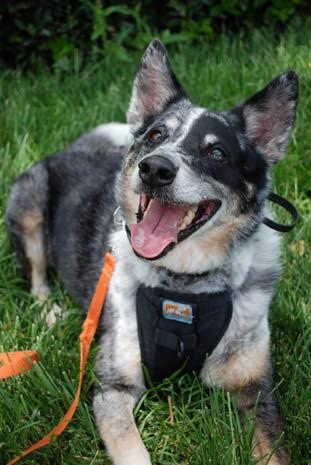 If you really love interacting with a dog and think you just might be “smarter than an Australian Shepherd mix” – you cannot go wrong with me! I am really smart and really sweet and all I want to do is be your best friend, learn how to communicate with you, and be by your side. If you think we could be a match, please click here.